Back in the training room, I asked the project team, “Can you solve the same problem twice?” I contend that you can’t. If you truly solve a problem the first time, it won’t recur. Toyota refers to their process owners as a “community of scientists.” They’ve blurred the line between how operators do their work and how they improve. Developing a problem-solving capability and arming problem solvers with a scientific method for getting to root cause will eliminate many of the small problems that negatively affect quality, safety and reliability (both process and equipment) each day. Some problems can’t be solved by process owners in the course of their work, but instead require the concerted effort of a cross functional team. Teams must also follow a scientific problem-solving method. But unlike process owners who solve problems locally, the team can investigate across functional boundaries and shifts and even the supply base. It is especially important to follow the facts, and always be prepared to rewrite the original problem statement as the facts narrow the scope of investigation. 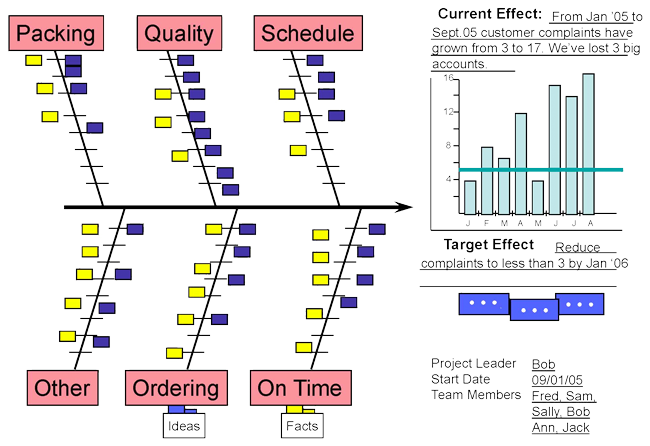 There are many problem-solving methods you can use including the 5 Whys, CEDAC (cause and effect diagram with the addition of cards), A3, 6M, DMAIC, etc. It is best to teach process owners a simple method that is easy to use and understand…5 Whys, CEDAC or A3 work best at this level. For more complex problems, 6M and DMAIC are better choices. Regardless of which method you employ…having a problem-solving capability in your organization will serve you well. For one thing, quality, safety, and equipment/process reliability will improve. Correcting a problem at the root cause when it first appears will also save you money. When a process “plans its own downtime” (i.e. breaks down) it will cost you 10 times more in time and money to get the process running again. Problems are opportunities to improve and grow. Invest the time and energy in correctly correcting problems when they first occur and you’ll never have to solve the same problem twice. I have a challenge for you…take a look around your facility and see how many ‘work-arounds’ have become embedded in standard operating procedures. How many “hopper boppers” or “fix-it gadgets” can you find? (I am confident you all know what these are and may have even used them yourself; if not, give me a call and I’ll explain.) Each one of the homemade tools you find are a direct ”fix” to a problem that no one has yet taken the time to correct. You can begin your problem-solving effort right there. If you need assistance or have any questions please feel free to make contact. You can reach me at the e-mail below. Quoting movie dialog is a big thing in my family. I am not sure how it started, but we do it often. Last week at a SMED training session, an attendee was reeling off movie lines to his team members.